July 17th 1975; As part of a mission aimed at developing space rescue capability, the U.S. spacecraft Apollo 18 and the Soviet spacecraft Soyuz 19 rendezvous and dock in space. 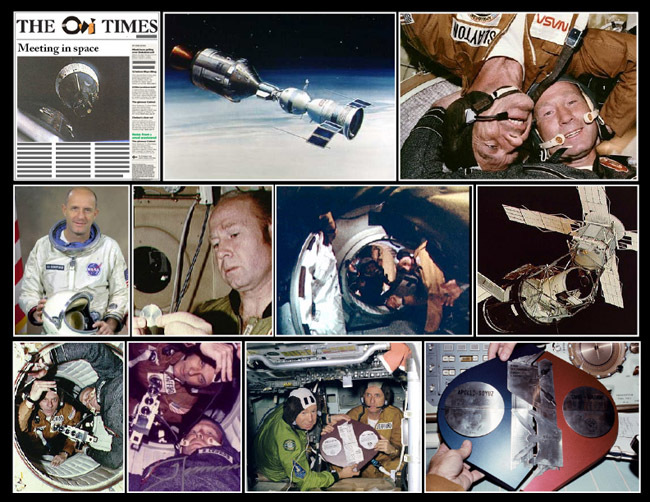 As the hatch was opened between the two vessels, commanders Thomas P. Stafford and Aleksei Leonov shook hands and exchanged gifts in celebration of the first such meeting between the two Cold War adversaries in space. Back on Earth, United Nations Secretary General Kurt Waldheim congratulated the two superpowers for the Apollo-Soyuz Test Project and praised their unprecedented spirit of cooperation and peace in planning and executing the mission. During the 44-hour Apollo-Soyuz embrace, the astronauts and cosmonauts conducted experiments, shared meals, and held a joint news conference. Apollo-Soyuz, which came almost three years after the sixth and last U.S. lunar landing, was the final Apollo program mission conducted by NASA. It was fitting that the Apollo program, which first visited the moon under the banner of "We came in peace for all mankind," should end on a note of peace and international cooperation. On the other hand, look where we are now: the Russians in the space station all by themselves refusing to transport the Americans to it. What have we learned? Apparently very little. Dante from the moon looks at the earth which appears to him as a jewel in space and exclaims: "And I saw that flower garden which makes us such savages." He did not need to become an astronaut to experience such a vision; all he needed was his imagination. The contrast there between the beauty of the universe and the ugliness of man's nefarious deeds (think of the Middle East right now...) is indeed uncanny and prophetic worthy of a great poet.